Caravan Review 2019: Is Caravan a Good Hosting? Caravan is a top-ranked Russian telecommunications company that offers smart telecommunications services such as domain registration and web hosting for businesses, with special offers for dealers. Caravan is a privately held entity established in 1996 focusing on the B2B model. It started as a hosting vendor but since 2017 has gained widespread expertise in building and providing cloud infrastructure. This has enabled its specialists to develop and provide optimal solutions for its over 5,000 customers ranging from small-medium enterprises to large. The company is based in Russia and it offers services mainly in Russian and English. 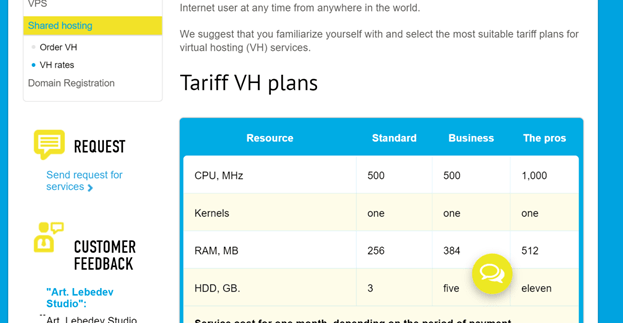 There are three shared hosting plans available with the entry-level plan featuring CPU of 500MHz, 256MB RAM, and 3GB HDD. All of these can be upgraded to CPU of 1000MHz, 512MB RAM, and 11GB HDD in the highest level plan. All of the shared hosting plans feature a multifunctional Vesta control panel. It is not the typical user-friendly cPanel, but it does come with an easy to use user interface to help you manage your hosting account. Moreover, newer versions of the control panel also feature the Softaculous auto-installer, which is a beginner friendly app that allows you to deploy over 400 scripts and apps with the click of a button. There are no specific guarantees for uptime but the shared hosting comes with a failover cluster. This means that there are a series of servers that support one another so that when one experiences downtime, another one takes over its workload. This will ensure that your websites are always up and running. The VPS services have been keenly designed to accommodate every resource that has already outgrown virtual hosting but does not yet need physical or cloud infrastructure. This feature works on both Windows and Linux and you can test it out anytime to practically evaluate the server yourself without paying for a long-term contract. Caravan values its customers’ trust and provides all of its incredible products and services at very convenient rates. With them, you not only order and select an appropriate tariff plan but also get dedicated expert help and advice. The only things that I didn’t like about Caravan is that it doesn’t offer any money-back guarantee and users aren’t given access to the entire disk space specified in the different plans since 1.3GB or more is set aside for administrative requirements. This kind of hosting would best fit the needs of a small project and/or startup. The plans have flexible billing terms, which include monthly, semi-annual, tri-annual, and annual contracts. As is typical, all contracts other than the monthly contract offer a discount, with the annual contract offering the largest discount. These contracts can be paid for via bank cards online or electronic money systems such as QIWI, WebMoney, and Yandex Money. Caravan offers 24/7 customer support through live chat, phone, and email support. I tried out the live chat option and was satisfied with their agent’s courtesy and ability to answer questions adequately. Another plus is that for the entire period of service you will have your own personal account manager who will not only provide an accurate understanding of your needs, but also the most prompt solutions. Caravan uses modern cloud technologies, following the current trends in the development of the modern IT market. 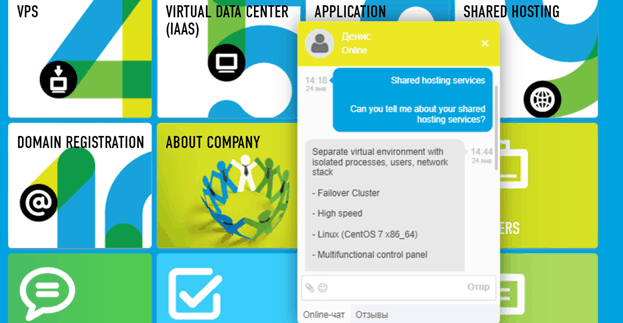 It could be just what you’re looking for if you need high performance services in cloud backups, IaaS, shared hosting, VPS, and domain registration with great customer support. Wondering how Caravan stacks up against other Web Hosting companies? Enter any other Web Hosting company and we will give you a side-by-side comparison.